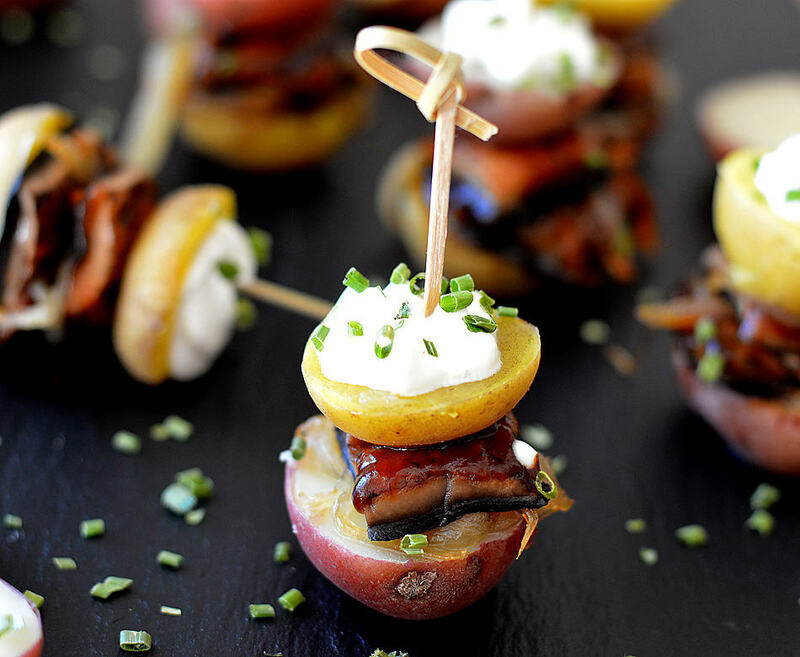 You will love these little Barbecue Portobello Steak and Potato Bites as appetizers for your next game day party or get together. 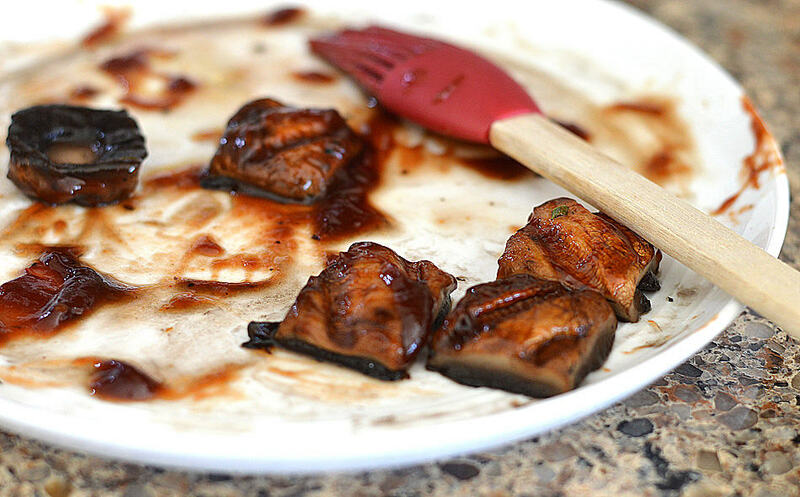 Of course since they are vegan, these “steaks” are actually portobello mushrooms that I’ve grilled and slathered in my favorite barbecue sauce. 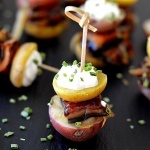 Stacked with caramelized onions, halved baby creamer potatoes, topped with vegan sour cream and of course, chives. They are full of flavor! I boil the potatoes whole and allow to cool just slightly before slicing in half. If they are very rounded, I do trim off the slightest amount on the bottom to maintain stability. Season with a pinch of salt and pepper at this point. You can buy large portobello mushrooms or, as I have here today, the baby bellas. I removed the stem and some of the gills, trimming the sides to form a square. Save those bits and add them to your next batch of spaghetti sauce! In a pan over medium-high heat with a small amount of oil, saute the onions. Sometimes I give them a sprinkle of sugar to expedite the caramelization process. I have zero patience 🙂 Be sure to stir frequently. You want plump, juicy onions for this recipe. Lightly oil a hot grill pan and place a plate on top of the mushrooms. This helps us get those grill marks and of course if you have an outdoor grill, you can certainly do that as well. Here are the skewers I used. They are the perfect size and also give added stability to the stacked veggies. You can get creative here, but I started with a potato and topped with a mushroom, caramelized onions, another mushroom followed by another potato. I used a piping bag fitted with a large star tip for the vegan sour cream and garnished with chives. And that’s it! 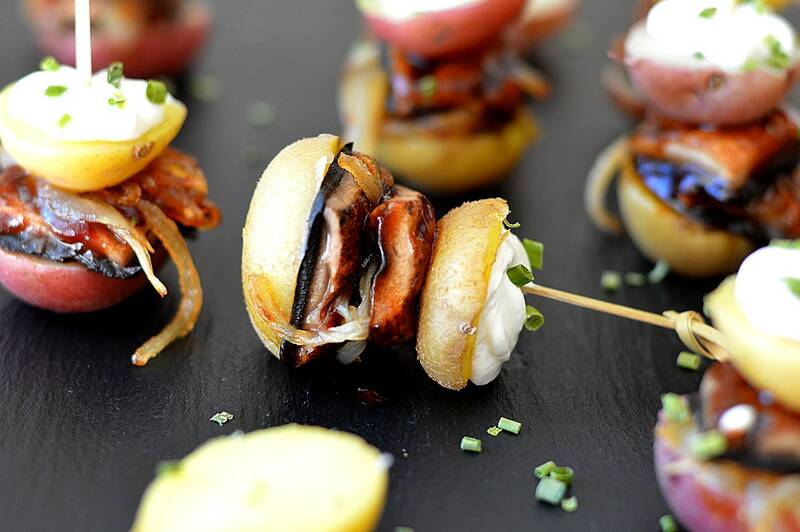 Did you make this recipe for Barbecue Portobello Steak and Potato Bites? Let me know what you thought in the comment section below. In a large pot of water, boil the potatoes whole. Cook them just until tender, but do not overcook. Drain and set aside to cool slightly. In a non-stick saute pan with a small amount of oil, cook the onions until caramelized. OPTIONAL: To speed up the caramelization process, I sometimes add just a sprinkling of sugar. 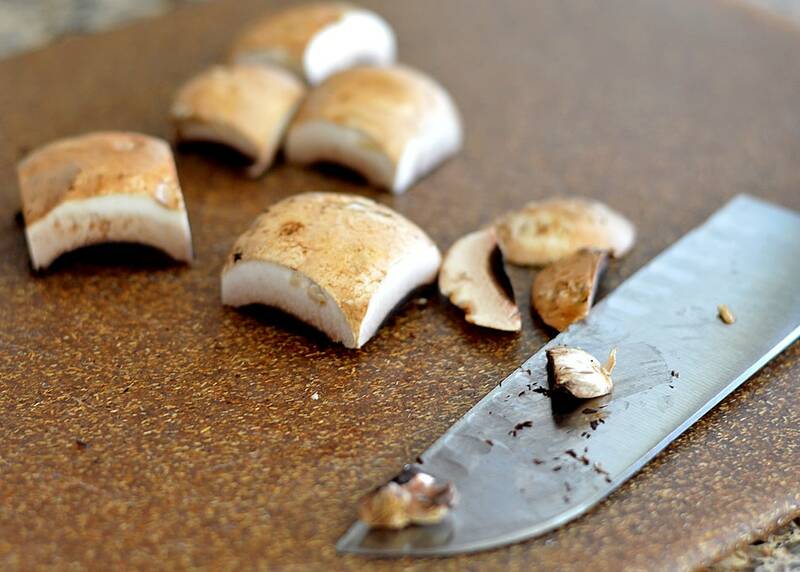 Clean and trim the baby bella mushrooms. You can remove some of the dark gills, but I don't. 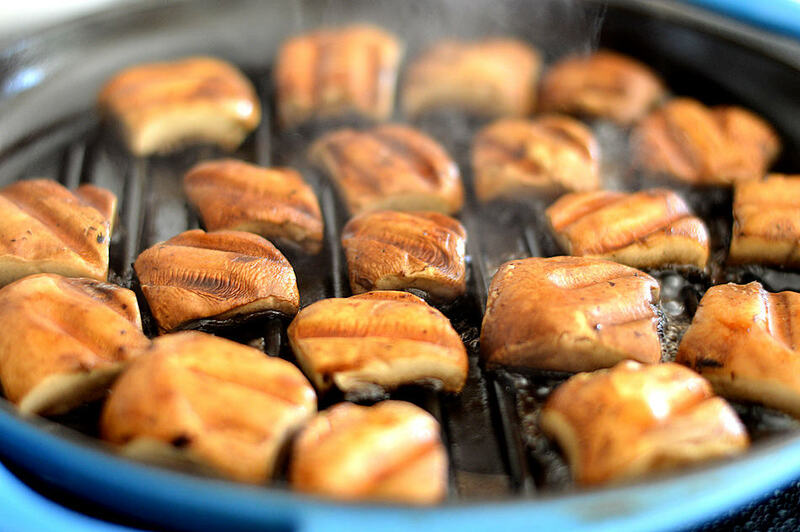 In a grill pan over high heat (or on an outdoor grill) brushed with oil, place the mushrooms cap down and cover with a plate. I also weigh it down with a can just to be sure I get those desired grill marks. Flip the mushrooms and cook for just a minute or two. Set aside and brush with barbecue sauce. Season with a pinch of salt. Slice the potatoes in half and if they are too round, trim just a very small amount off the bottom so they will stand upright. Season with pinch of salt and pepper. Start the stack with a potato half, then a mushroom, then onions, another mushroom and another potato using a skewer to secure. Using a piping bag with a large star tip, add sour cream to the top. Garnish with chives.